This is the story of how a flat track motorcycle racer, turned firefighter, turned father, turned retired dude, finally became a mountain biker. It turns out an electric mountain bike was the catalyst to get Pat McCaul back in the mix of things. Watch as Pat’s sons, professional mountain bikers Cam McCaul and Tyler McCaul, take their dad for a mountain bike trail ride — then are joined by Pat’s five-year-old granddaughter, Chloee McCaul, on her 20″ mountain bike. Three generations of family riding bikes together — all thanks to the fact that there’s a bike for everyone these days, no matter how old or young. 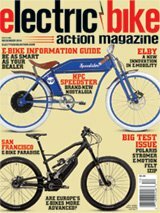 Interesting in hitting the trails on an electric bike? Check out off-road e-Bikes.